A car’s cooling system keeps the engine from overheating, avoiding a host of problems in the process. You see, your engine’s efficiency depends on the effective circulation of the coolant. The engine bears the bulk of the work in moving the vehicle from one place to the other. In the process, it produces a significant amount of heat, which if left unchecked can spoil the engine and ground the vehicle – something you never want to happen. As the car runs, and you enjoy the ride, the temperature of the coolant hits the roof, expanding in the process. To prevent problems, the already expanded and excess coolant moves to a reservoir tank. However, the wear and tear can get to the system, and if not fixed promptly, it can lead to a host of engine problems, and expensive repairs. A weak radiator cap can as well be the main avenue for an overheated coolant. The coolant employs pressure to circulate the coolant effectively, and an ill-fitting cap can release this pressure leading to coolant loss. However, you can easily conduct a pressure test in the radiator to identify any problem. An internal leak will not form a puddle of coolant under the vehicle. Instead, you will find yourself having to refill the radiator now and then to keep possible overheating at bay. An internal leak can come from a faulty head gasket or a block. An external leak is the easiest to identify. For starters, you will notice that your engine overheats pretty quickly. You can also look for a hole or broken hose along the system. Other avenues that the coolant can use to escape, and which are easy to identify, include engine freeze plugs, heater core, and water pump. Before you can begin the inspection, make sure that engine cools sufficiently. You see, a hot radiator contains pressurized steam, which can forcefully spew out when opened, posing a safety risk. Wear safety goggles if it is necessary to go under the car. Typically, the goggles will protect your eyes from possible falling debris. There are various causes of radiator leaks, and each varies regarding severity. The easiest way that you identify a leak is through the collection of coolant under the car. If you are observant enough, you’ll notice that the reservoir tank is not at the level it should be. That can highlight a gradual leak somewhere in the coolant system. Another sign of a leak is a sudden engine overheating. You can also smell out the leak while getting into the car. Typically, it is not so hard to identify a leak; it only takes your determination to find it. To locate the leak, use a hose to clean the radiator of any coolant, debris, and grime. 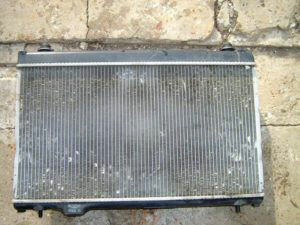 A clean radiator is easier to identify possible leaks. You can use paper towels to rub any excess coolant. Start the engine and visually look for coolant running down the lines or radiator and listen for any possible hissing sounds as the pressure tries to escape. You can also use a pressure tester purchased from an auto store. Install the tester in place of the replaced radiator cap and pump about ten pounds of pressure. If it shows a loss of pressure, then you have yourself a leak somewhere along the system. Look for these leaks by listening for hissing sounds and seeping coolant. As the adage goes, there are various ways of skinning the cat. In the context of radiator leaks, there are various methods of sealing the leak and ensuring that your engine is running as it should. Using a Leak Sealant: one thing that would make you happy is that there are various leak sealants you can purchase to seal that leak. And regardless of the brand you choose, the instructions for use are fairly the same across them. Switch the engine off, and allow it to cool before removing the cap. Pour the contents of the sealant into the coolant system, and top it off with a mixture of water and coolant if necessary – the top off is when the engine is low. Cap the radiator and start the engine. Typically, the leaks will seal off as the coolant seal makes its way around the system. Let it run for about ten minutes and allow sitting for the whole night as the sealant settles. However, you should note that the use of leak sealants is what we can refer to as a stop-gap solution. It is temporary and for small leaks until you find a more permanent solution. Using an Epoxy: you can purchase an epoxy to seal the visible holes and cracks from the majority of auto stores – it should not be hard. The first thing you should do is identify all possible holes or cracks, and clean them thoroughly. To prevent grease from affecting its effectiveness, use a rag dipped in brake cleaner to remove every trace of oil, and give it time to dry. Don’t attempt any sealing while the area is moist, lest it be Put some epoxy in your hands and knead it sufficiently before application on the affected areas. Spread it generously around on the crack and remember to keep it at least an inch thick. It is important so that it can easily deal with any coolant pressure and recurring problems. Using Pepper: pepper is yet another method you can employ to hold it together until you can get home or the auto-repair shop. Let the engine cool and pour half a shaker of black pepper into the radiator system. The pepper will then collect in small holes as the engine and pressure try to blow it out, thus creating a temporary seal. And unlike the egg yolks, pepper can hold longer cracks, but temporarily. Using an Egg: eggs are another stop-gap solution until you are ready for a permanent solution. To go about it, separate the egg whites from the yolks and discard them. You should remain with yolks from about four yolks. Put them into the coolant system and start the engine, the same way you would a leak sealant. The eggs should hold the pressure long enough until you get to the auto repair shop. Please note that the egg yolks method is less reliable than the commercial sealants and can potentially cause clogging troubles along the lines. Use it in emergency cases. Checking the Repair: no matter the method of repair you use, make sure to check if it is still leaking after driving a short distance. And if it is still leaking, repeat the repair process. If the cracks or holes are too big, they may be beyond repair, and a radiator replacement may suffice. Another thing to note is that pepper and egg yolks are not permanent solutions. They are to hold the leaks until you get home and use a commercial sealant or epoxy. And if the level is down, refill the radiator with a 50/50 fusion of water and coolant.